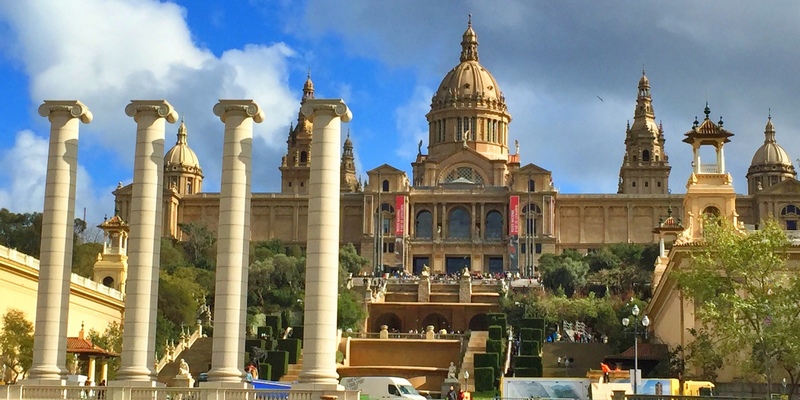 After I decided to explore Barcelona, It took me five minutes until I booked a flight departing few days later towards Spain. Driven by all the amazing descriptions from friends and other blogger I had to take the chance to get an idea of Barcelona on my own. This time I have the chance to explore the town together with a good friend I met on my last trip to Thailand. Her fascination for Barcelona was one of the reasons for me to finally book the flight. It seems that the weather god is on our side, because the sun is shining after we landed, so that we make our way tot he hotel dressed in a shirt. We meet a friend in Barcelona who lives there and enjoy a wonderful and typical Catalan like meal. We have a full plan of places, buildings and restaurants we would like to visit during our stay, so that we decide to explore the city after lunch by feet on our own. On our way down the streets we cross breathtaking buildings by the famous architect Gaudi. It feels a bit like beeing in Rio again, while the surfers are waiting fort he perfect wave in front of the beach. The city’s arcitecture with this warm brown tones due to the sandstones that were used for the buildings. I´m totally impressed by the influence of the modernism that defines the city scape. Details that are influenced by natural elements like wood or leaves create a special scenery. If you ever have the chance to go to Barcelona you have to visit Gaudi´s Sagrada Familia. You will also enjoy and love the food in that city . Away from the restaurents that are specialized to fulfill the expectations of tourist you are able to find small bars which offer original, handmade tapas. Even though it´s still the first day I spend in Barcelona I realize, why so many other people are that fascinated about it. It´s a unique charme you wont find again in any other city. I want that cable sweater. Now. Thank you for the postcard! I am transported to Las Ramblas with you! We are walking in the sunshine making fun of tourists. We enjoy cocktails and anchovies while enjoying the sunset. And I see you found the plaza with the flea market. There is a lady there who sells teeny tiny religious medals for 5 euros each. They are exquisite. So we are also shopping. The people in Barcelona are the nicest people on earth. Except for you, of course!